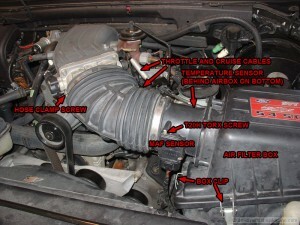 How to clean your Throttle Body and Mass Air Flow sensor on a Ford Lightning | .:spikapino:. 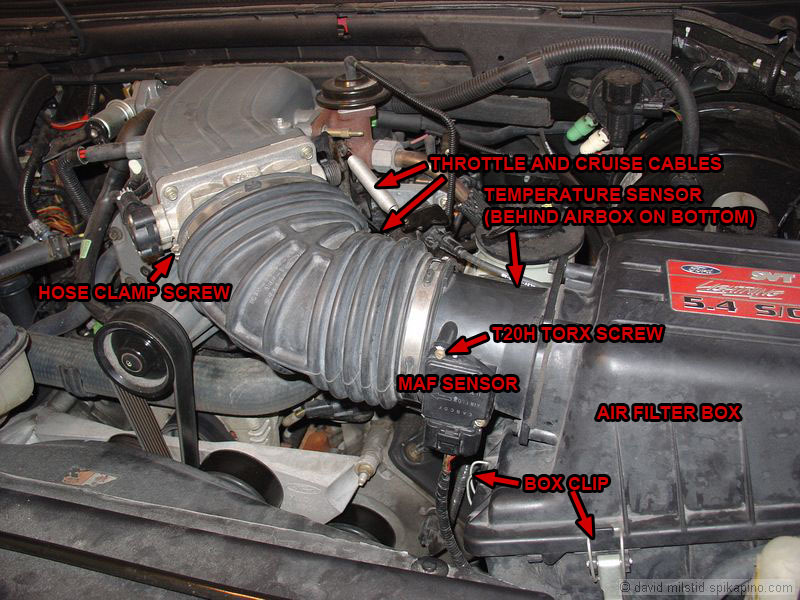 A gummed up throttle body and mass air flow sensor can cause all sorts of problems including: decreased throttle response and decreased fuel mileage. 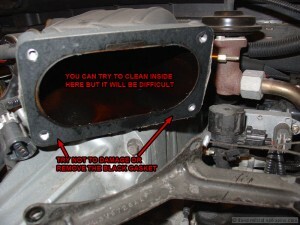 The carbon/oil/gunk build up is cause by a couple things: dirty air leaking past/through your air filter and oil sucked into the intake via the positive crankcase ventilation (PCV) hose. Here is a simple guide detailing how to perform routine cleaning on your Ford Lightning’s intake. 1) Start out by removing the wire harness from the mass air flow (MAF) sensor attached to the front side of your air filter box and the wire harness from the intake air temperature sensor on the back side of your air filter box. This can be accomplished by pressing in the small tab at the base of the harness with your finger (or small screw driver) and pulling the harness away from the sensor. 2) Using your flat head screw driver, partially remove the screw from the hose clamp that is securing your intake hose to the throttle body. On the bottom side of the hose, right below the hose clamp, there are three hoses that need to be removed (idle air bypass/control hose, a small vacuum hose, and your PCV hose). Pull these straight down, they may be hard to pull out. Don’t worry, just pull hard. Pull the intake hose out and away from the throttle body. It will be stiff and will allow for little play. 3) Unclip each of the three clips on your air filter box. 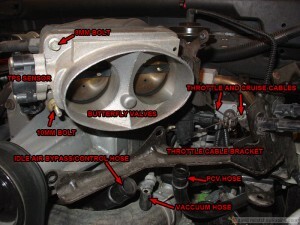 Using one hand, guide the end of the intake hose (the end next to the throttle body) up and away. Using the other hand, pull the air filter box towards the engine and up and away. It should slide right off. 4) To remove your MAF sensor from the side of the air filter box, you’ll need that T20H security torx bit. Simply remove the two screws and pull the MAF sensor straight out. This sensor is very delicate, be careful not to touch the two sensors that are in it and place it on something clean (paper towel) while not handling it. 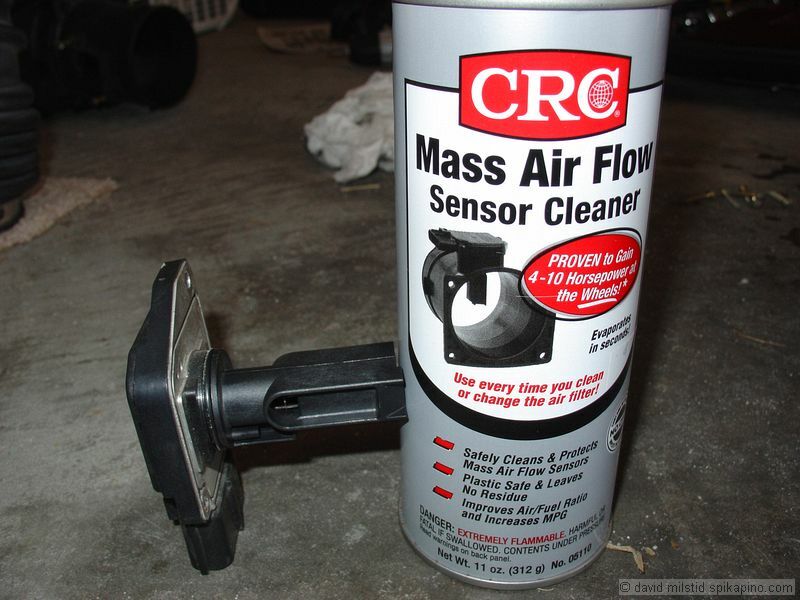 5) To clean the sensor, follow the instructions on the back of the CRC MAF sensor cleaner can. 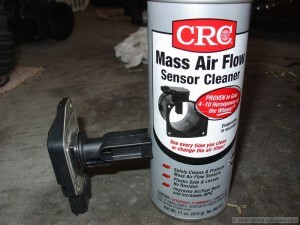 Be warned that cleaning your MAF sensor with anything other than a good “MAF sensor cleaner” will most likely harm it. While cleaning your MAF sensor, you’ll never touch it with any solid objects (paint brush, tooth brush, etc). Clean it only using the pressure from the can. Set it aside and let it dry. 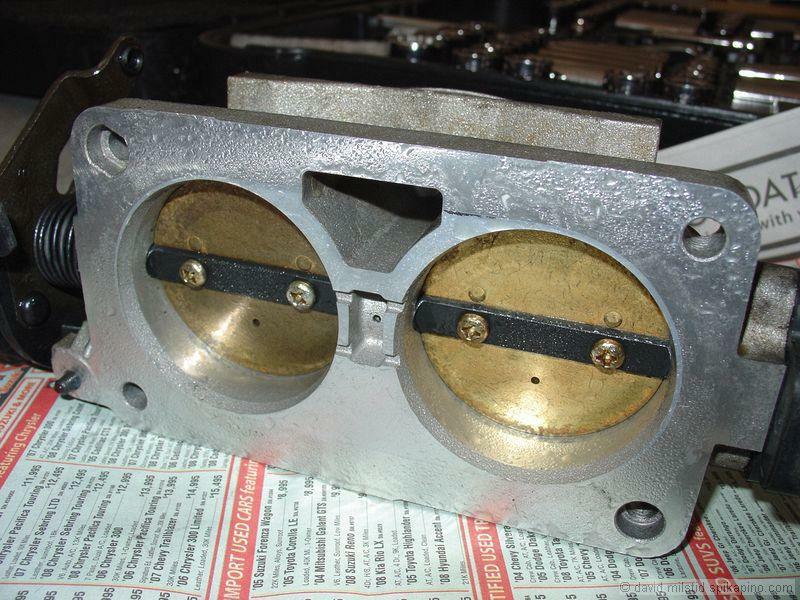 6) To remove your throttle body, you’ll need to remove the the bolts (8mm and 10mm) on the four corners of the throttle body as well as from the base of the bracket that is attached to the bottom two bolts on the throttle body. To remove the cruise and gas pedal cables, wait until the throttle body is off of the plenum. Once this is done, it is simple to see how these cables are removed. Under no circumstances should you try to remove the throttle position sensor (TPS) from the opposite side of the throttle body. This sensor is tuned and should not need to be cleaned or moved. Also, there should be a black gasket stuck in between the throttle body and the plenum. Do not remove or damage this, you’ll need to reuse it. 7) To clean the throttle body, simple use your can of throttle body cleaner with the red hose attached and spray every inch of it. The pressure alone should clean it but for stubborn stuck-on carbon, use a toothbrush. Be sure to open and close the butterfly valve with your hand to clean where the it closes against the inside of the two air openings. Depending on the weather, you’ll probably get a lot of condensation build up on the throttle body after you finish cleaning. Make sure you let this dry, or dry it off with a paper towel. 8) Once this is done, follow the steps in reverse to reinstall everything. The throttle-body-to-upper-plenum bolts should be torqued to 89 inch-pounds. If you don’t have a torque wrench, tighten them “good and snug.” Make sure you check your air filter while you have this off. Replace it if need be. 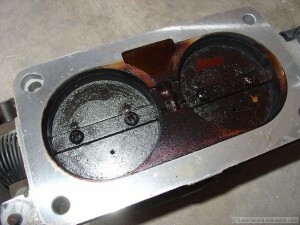 If you have a K&N, this will be a good time to clean and re-oil it (see next step). 9) For good measure, you may want to disconnect your negative battery cable and let the truck sit like that over night. This will insure that the computer will reset and have to “relearn” your *hopefully* new-and-improved MAF sensor readings and throttle response differences. You sir, need to clean your engine bay. I decided to stop being lazy and updated the post with higher quality photos.